Sand Volleyball Tournement for Girls and Boys. Competing with teams from all over the region. Sharing their passion for volleyball. The AAU Eastern Regional Championship tournament has teams across the East Coast showcasing their talent. There will be crowds at this TVA promoted event held May 19th, at 11th Street on the Virginia Beach Ocean Front. Surrounded by waves, the boardwalk, restaurants and Monster Trucks the event is sure to be a smash…one with awards, bids and swag bags! The Girls 12U,14U,16U & 18U are competing for a bid to the West Coast Junior Olympic Nationals in Santa Monica, California. Where they will play teams from all over the nation and even some international teams. Along with the opportunity to be seen by scouts on the college and professional level. The Eastern Regional Championship is for everyone with passion for volleyball. Boys 14U, 16U & 18U are able to connect with players from across their region. Heightening the level of play and showcasing the skills of the East Coast. We encourage the elite AAU members to compete in Hermosa Beach. 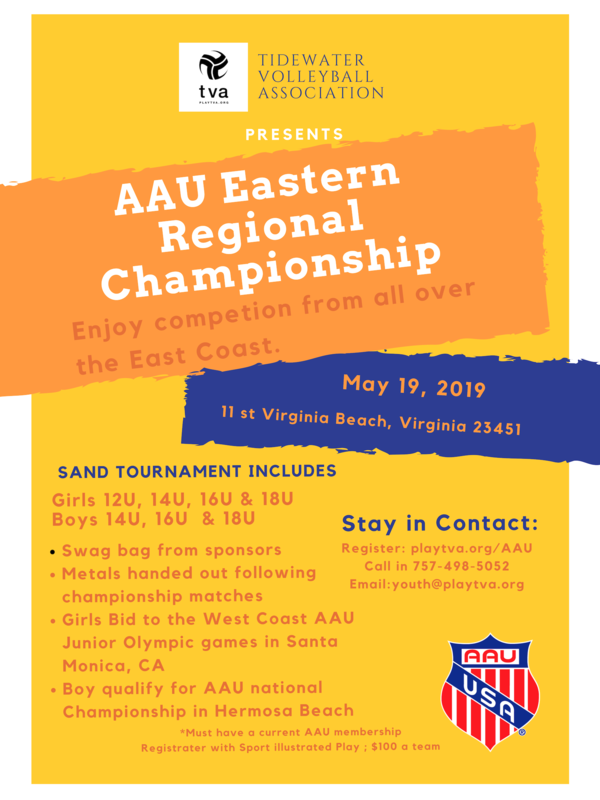 Where you can take your partner or one that you meet at the Eastern Regional Championships to the boys AAU Junior National Championships or for 14U The Best of Beach. In California where sand volleyball is year round and many of the top colleges have mens sand programs. TVA and the championships promote growth in the volleyball community through inclusion and competitive volleyball play. There will be an Award Ceremony celebrating the accomplishment of placing in the AAU Eastern Regional Championships. Acknowledging the support and passion that goes into playing at the top of your game. TVA is bringing together the family for a weekend at the ocean front to enjoy good volleyball, good people and have a good time.